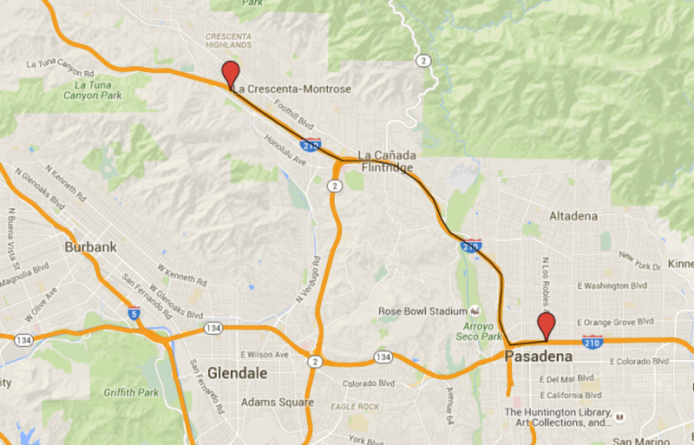 Commutes Thursday night and Friday morning will likely be affected in Pasadena, La Cañada Flintridge and Glendale due to the 210 Freeway closure, affecting the eastbound side. The eastbound 210 Freeway will be shut down beginning at 7 p.m. Thursday, the State of California Department of Transportation said in a statement. The closure will shut down the road from the Dunsmore Avenue undercrossing to the North Los Robles Avenue overcrossing. The lanes will reopen the following day, Friday, at 6 a.m.
Crews will be working to repave the lanes to provide a smoother and quieter drive for motorists, and extend the life of the pavement for 40 years according to the agency. Detours will be posted, directing drivers off the freeway. The project started April 2015, and will continue through mid-2018. Drivers will be detoured to the Colorado Boulevard off-ramp. Continue east to Walnut Street, then go east on Corson Street to the eastbound I-210 on-ramp.